In October I wrote about the awesome Merino Buff I bought, and which now is used by my girlfriend (because its so warm and fits under the bicycle helmet!). 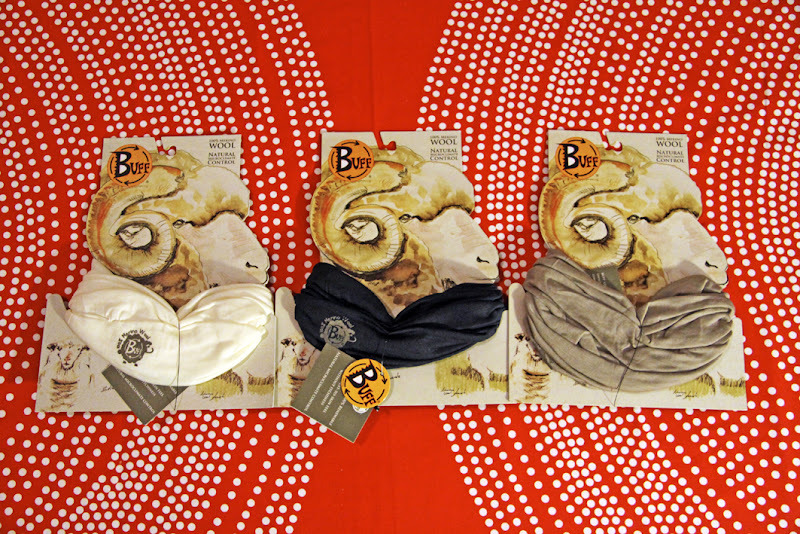 So I got in touch with Buff in Finland and they were so kind to send me three of their Merino Buffs for a raffle - a big "Thank you!" for Buff for making this possible! Three new Buffs looking for a head and neck to keep warm. Colours are, from left to right: Cru, Navy and Stone. Participation is very easy: You leave a comment underneath and explain why you should get a Merino Buff and in which style you like to wear it. At the end of the raffle, which will be the 16th of December 2009, I will randomly choose three lucky winners and contact them for their addresses. I ship worldwide, so everyone can take part. In case you can't wait to get one, check out Buff.es for some videos, and if your in very much of a hurry you can get one at Partioaitta and Retkiaitta. I also got some other new items from Buff, which I'll show you in the coming weeks, so stay tuned.